Anyone looking for a super quick and easy meal? Because that’s what this carrot soup is. So fast, so easy, and there are several options for cooking it – which always makes me happy. I like having options. If you need to get the soup going in the morning and have it ready when you get home, you can use the slow cooker. If you want to eat in about an hour you can do it on the stove (most of that time is just letting the soup simmer). And if you like crazy fast cooking (I know I do!) 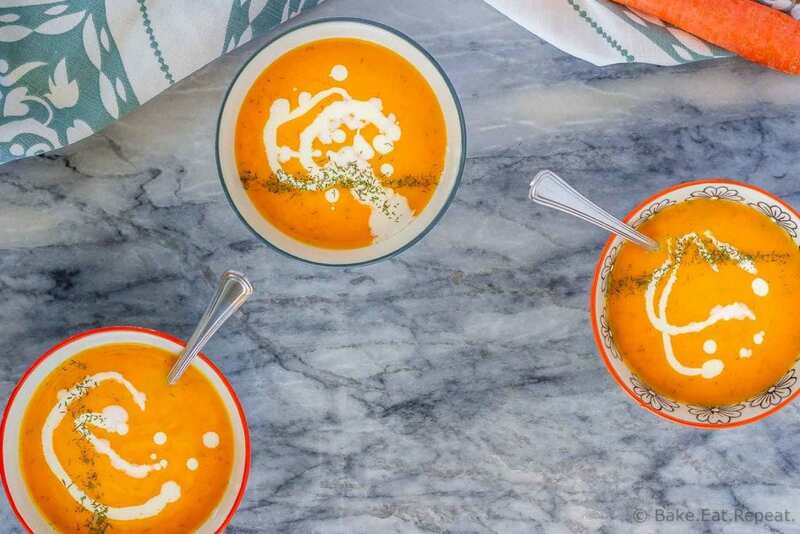 then pull out your Instant Pot, and you can be serving up this tasty carrot soup in under a half hour. This soup can also be served either hot or cold, and can be made a day or two in advance as it reheats well. I feel like that checks all the boxes for a soup recipe, right? No meat, which at my house means a few disappointed people, but I enjoy having a light meal like this sometimes. What do you eat with carrot soup? I like carrot soup for a meal, and simply serve it with a quick salad and some of these cream biscuits. It makes the perfect quick and easy meal for those nights you’re not super hungry, or just don’t feel like cooking much. It’s also perfect for lunches, either kept warm in a thermos or served cold. I will admit that my kids are not super huge fans of this soup, but I also don’t think they’ve given it much of a chance. I’ve been making it for years, and the first time I made it for the kids, I used some carrots that weren’t at their peak. I don’t recommend that. Use nice, fresh, preferably organic carrots for this soup – you can taste the difference here! So, it wasn’t that great the first time the kids tried it, and now they won’t give it another shot. Oh well, I’ll wear them down. 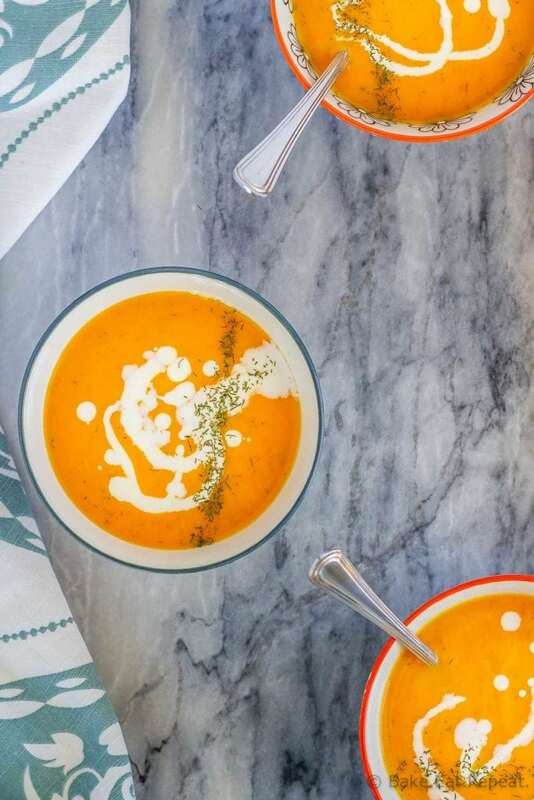 They’ll like it eventually – carrot soup with dill in it is just too good for them to be missing out on! 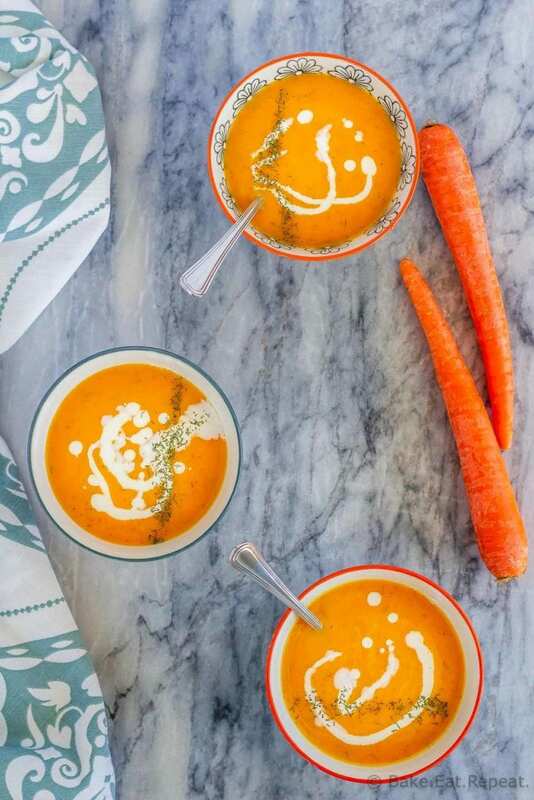 How do you make creamy carrot soup? I actually don’t even use cream in this carrot soup and it’s thick and creamy enough for our tastes. Stirring in some 2% milk at the end of the cooking time makes it taste creamy, but you could certainly use cream instead if you want your carrot soup to be thicker and creamier. What spices do you put in carrot soup? There are many different versions of carrot soup, but this one only uses dried dill for seasoning. There’s also some fresh onion and garlic in it for flavour, but most of the flavour comes from the carrots themselves. That’s why it’s important to make this soup with carrots that are nice and fresh, rather then the ones that have been forgotten about in the bottom of the fridge! I’ve also shared this Carrot Soup recipe over on Food Fanatic. I was thinking of serving carrot soup as a Thanksgiving starter, so I’m going to use this recipe! Without the dill, however. And it’s so pretty!